Makes "Pursuing My True Self," "Heaven" and "Quelorie Magic!" available as BGM for battles and the main menu. Makes "Never More," "Time to Make History" and "It’s SHOW TIME!" available as BGM for battles and the main menu. Makes "Shadow World," "Let's Hit the Beach" and "True Story" available as BGM for battles and the main menu. NOTE: If you download "System Data ver. 1.30" or "Additional Character 1, 2 or 3", some BGM tracks will become the full-length versions. Makes "Reach Out to the Truth -Instrumental Ver.-" available as BGM for battles and the main menu. Makes "Someone Else's Man" available as BGM for battles and the main menu. Makes "MAZE OF LIFE," "Light the Fire Up in the Night DARK HOUR" and "Light the Fire Up in the Night MIDNIGHT" available as BGM for battles and the main menu. NOTE: If you download "System Data ver. 1.30" or "Additional Character 1, 2 or 3", some BGM tracks will become the full-length versions. 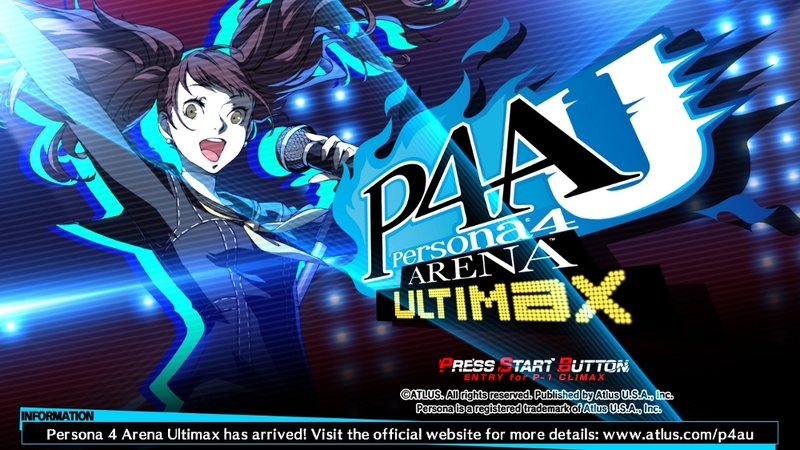 Makes "The Arena -Naked Mix-," "The Hero from Junes -Electro Mix-" and "Like a Dragon -Girl Pop Mix-" available as BGM for battles and the main menu. NOTE: If you download "System Data ver. 1.30" or "Additional Character 1, 2 or 3", the BGM tracks will become the full-length versions. Unlocks demonstration videos for Challenges #25 and #30 in Challenge Mode for all characters. NOTE: This content can be unlocked normally through gameplay. 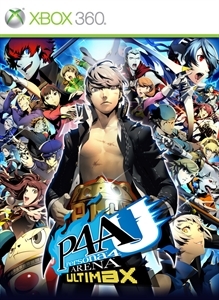 Makes "Persona" available as BGM for battles and the main menu. All 26 Round Call voices and all 6 Narration voices will be unlocked. You will be able to select the characters of your choice to perform the Round Calls and Narration. NOTE: This content can be unlocked normally through gameplay. 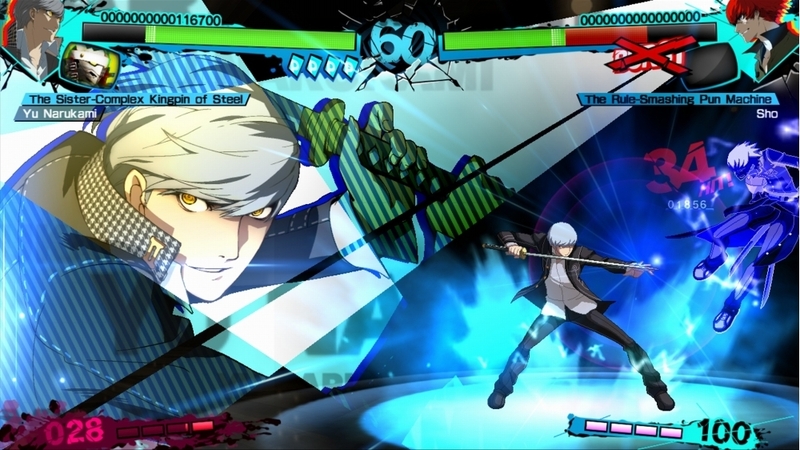 Commentary voices for Versus and Network Modes for the support characters new to P4AU: Yukari, Junpei, Ken, Yu, Chie, Yukiko, Kanji, Naoto, Akihiko, Elizabeth, Labrys, and Adachi (12 characters total). NOTE: This DLC set includes the contents of other individual Navigation DLC. 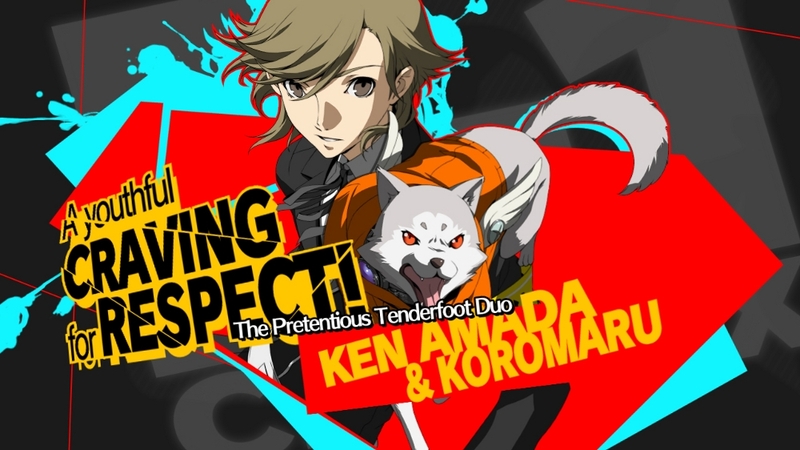 NOTE: This content (excluding Adachi) can be unlocked normally through gameplay. 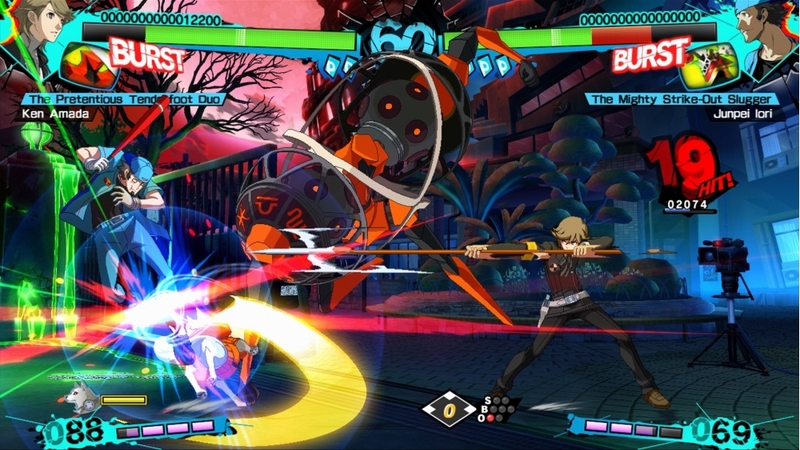 Makes "P3 FES," "Brand New Days" and "Darkness" available as BGM for battles and the main menu. NOTE: If you download "System Data ver. 1.30" or "Additional Character 1, 2 or 3", some BGM tracks will become the full-length versions. Makes "Burn My Dread," "Memories of You" and "Deep Mentality " available as BGM for battles and the main menu. NOTE: If you download "System Data ver. 1.30" or "Additional Character 1, 2 or 3", some BGM tracks will become the full-length versions. Makes powerful boss versions of the characters available to play as. NOTE: Boss Characters are unavailable in certain modes. NOTE: This content can be unlocked normally through gameplay. 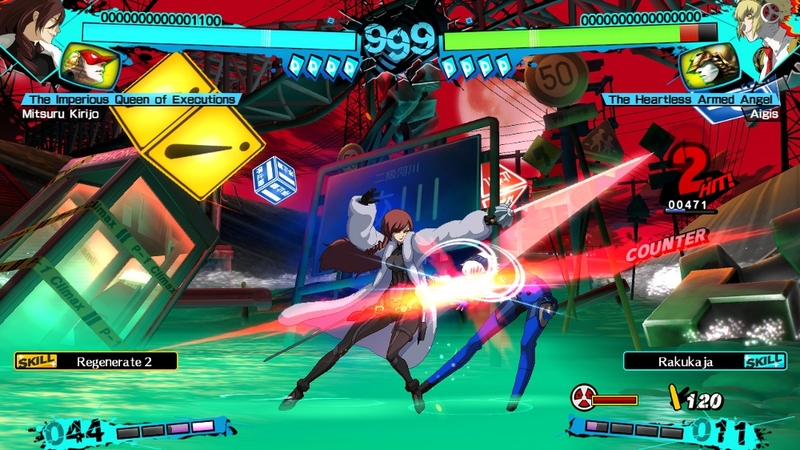 Enable commentary by Yukiko for Versus and Network Modes. 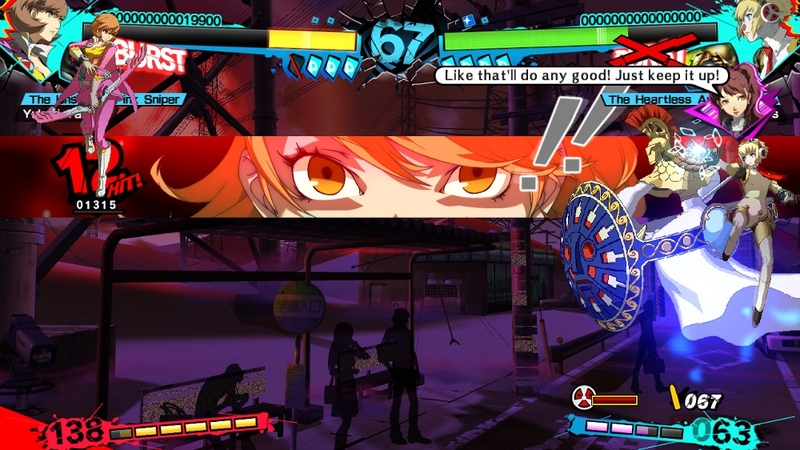 Also allows you to select Yukiko as a partner in Golden Arena Mode. NOTE: This DLC is included in "Navigation Set B." NOTE: This content can be unlocked normally through gameplay. Enable commentary by Ken for Versus and Network Modes. Also allows you to select Ken as a partner in Golden Arena Mode. NOTE: This DLC is included in "Navigation Set B." NOTE: This content can be unlocked normally through gameplay. 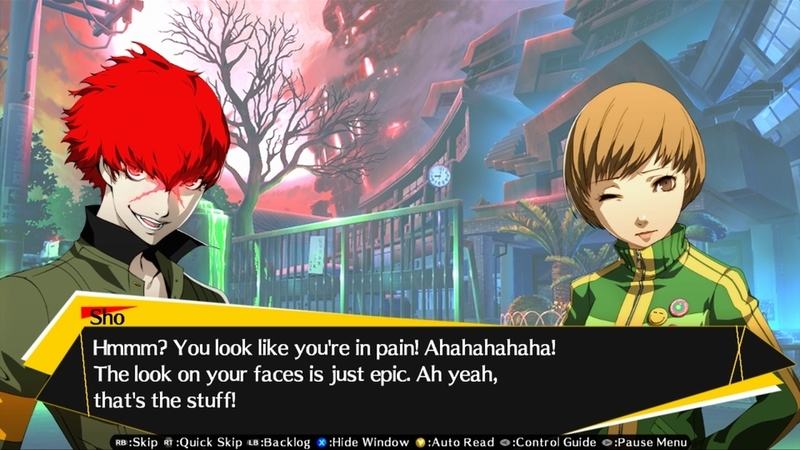 Enable commentary by Chie for Versus and Network Modes. 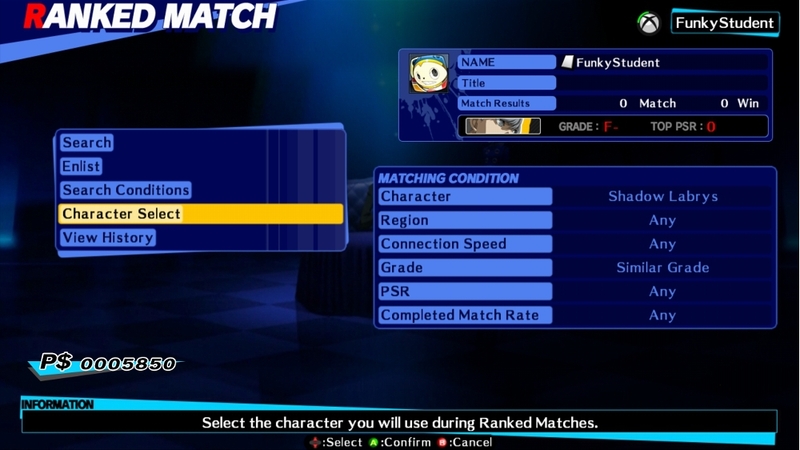 Also allows you to select Chie as a partner in Golden Arena Mode. NOTE: This DLC is included in "Navigation Set B." NOTE: This content can be unlocked normally through gameplay. 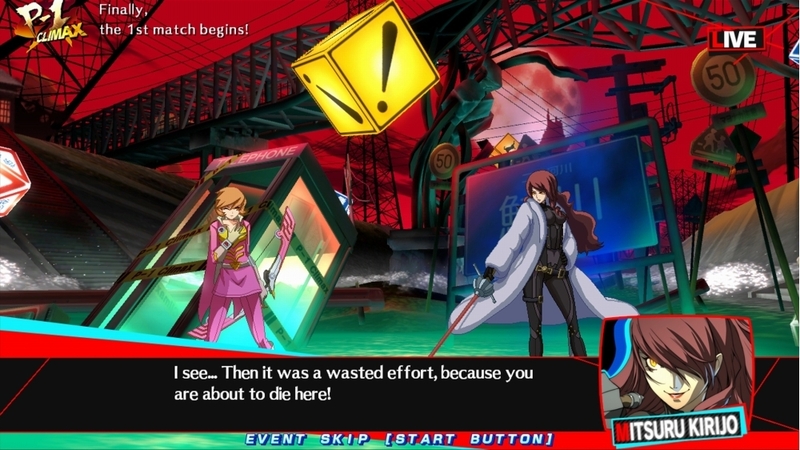 Enable commentary by Yukari for Versus and Network Modes. Also allows you to select Yukari as a partner in Golden Arena Mode. NOTE: This DLC is included in "Navigation Set B." NOTE: This content can be unlocked normally through gameplay. Enable commentary by Akihiko for Versus and Network Modes. 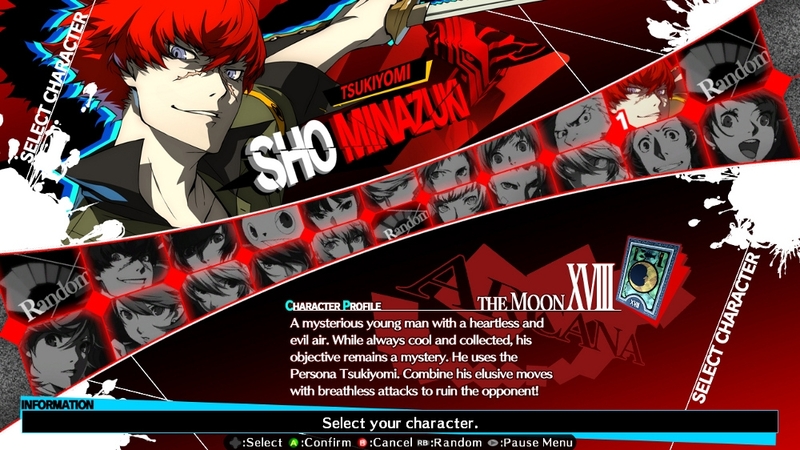 Also allows you to select Akihiko as a partner in Golden Arena Mode. NOTE: This DLC is included in "Navigation Set B." NOTE: This content can be unlocked normally through gameplay. Makes "Soul Phrase -long ver.-," "Wiping All Out" and "Sun" available as BGM for battles and the main menu. Adds Margaret to the roster of playable fighters. This DLC also includes Glasses and 6 colors + 2 offline-only colors for Margaret. The icons "Margaret B," "Margaret C," "Cu Chulainn," "Ardha" and "Yoshitsune" will also be available under P-Card Edit. NOTE: Downloading this will change certain BGM tracks into the full-length versions. Makes "Persona Invocation" available as BGM for battles and the main menu. Enable commentary by Elizabeth for Versus and Network Modes. Also allows you to select Elizabeth as a partner in Golden Arena Mode. NOTE: This DLC is included in "Navigation Set B." NOTE: This content can be unlocked normally through gameplay. Enable commentary by Junpei for Versus and Network Modes. 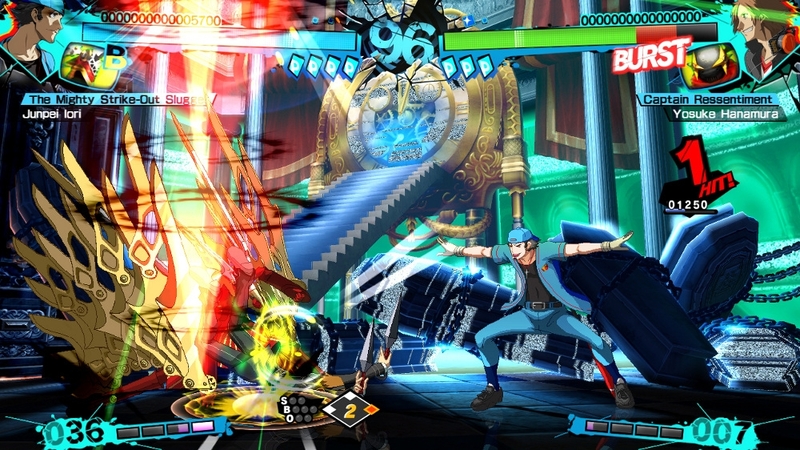 Also allows you to select Junpei as a partner in Golden Arena Mode. NOTE: This DLC is included in "Navigation Set B." NOTE: This content can be unlocked normally through gameplay. Enable commentary by Kanji for Versus and Network Modes. Also allows you to select Kanji as a partner in Golden Arena Mode. NOTE: This DLC is included in "Navigation Set B." NOTE: This content can be unlocked normally through gameplay. Enable commentary by Yu for Versus and Network Modes. Also allows you to select Yu as a partner in Golden Arena Mode. NOTE: This DLC is included in "Navigation Set B." NOTE: This content can be unlocked normally through gameplay. 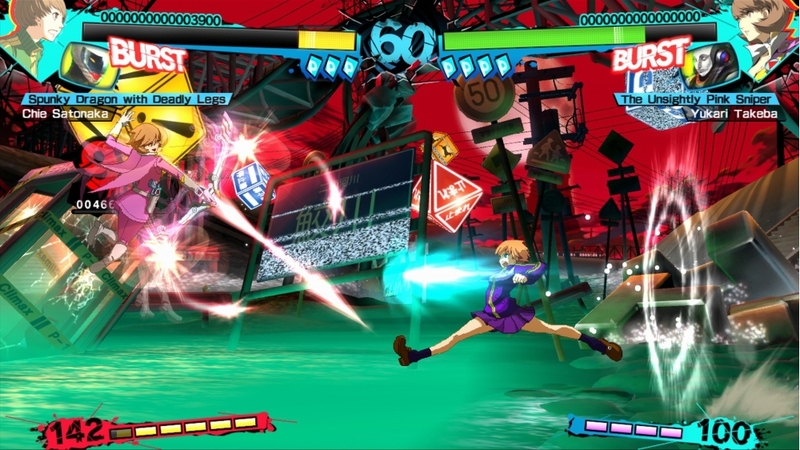 Enable commentary by Naoto for Versus and Network Modes. 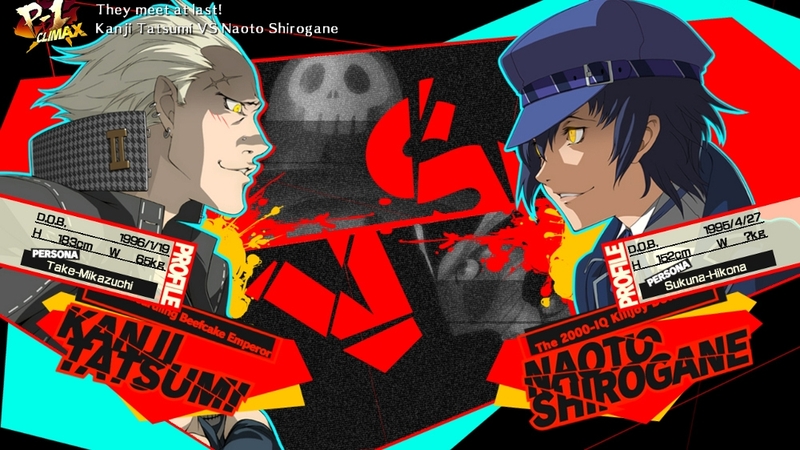 Also allows you to select Naoto as a partner in Golden Arena Mode. NOTE: This DLC is included in "Navigation Set B." NOTE: This content can be unlocked normally through gameplay. Glasses for all characters. You can select different glasses colors for each character to wear during battle. NOTE: This DLC contains all of the individual "Glasses Pack" DLC.